The Malta International Music Festival offers a special concert dedicated to Sergei Rachmaninoff’s 145th anniversary, a concert whose romantic hero will be Nikolai Lugansky, the most exquisite Russian pianist of extraordinary depth and versatility described by Gramophone as “the most trailblazing and meteoric performer of all.” The MIMF will hear Lugansky perform Rachmaninoff’s Rhapsody on a Theme of Paganini, which played by him, turns into the most tormenting and the most beautiful music in the world. “In music there’s 75 percent of the inexplicable, illogical, imperceptible, and 25 percent of what can be analysed. In music it is impossible to say what is right and what is wrong, where you won and where you lost. Life shouldn’t have appeared from dead nature but it did. Same with music,” believes Nikolai Lugansky. 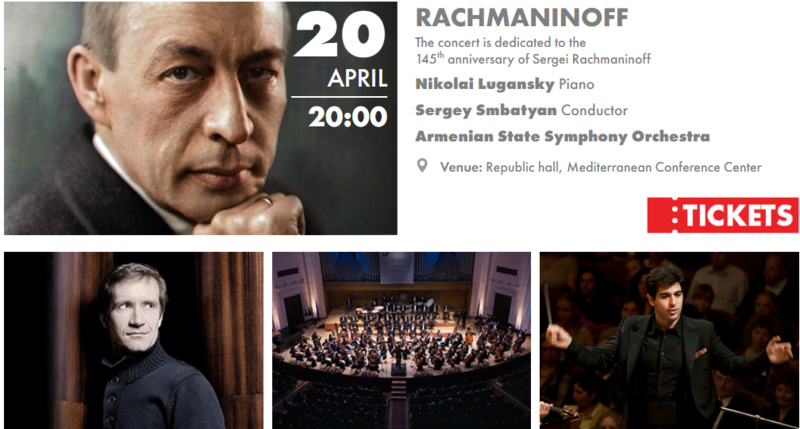 Lugansky, first time in Malta, will perform with the Armenian State Symphony Orchestra conducted by Sergey Smbatyan. “I heard a lot of good things about Smbatyan and his orchestra, them, so I am curious what will come of it. It is an orchestra of young musicians, these are people who are not yet tired of life, they enjoy learning, it is interesting for them to, in the course of two rehearsals, make themselves into something very different. This is always very attractive,” said Mr Lugansky. “Vocalise” is a song by Sergei Rachmaninoff, which started life as a song without text in 1915. Written for high voice (soprano or tenor) with piano accompaniment, it is sung using any one vowel of the singer’s choosing: the voice sings a vowel sound “ah” or “ooh” and is treated as an instrument. Rachmaninoff himself made The first non-vocal arrangement for orchestra we’ll be hearing tonight. The Rhapsody on a Theme of Paganini, Op. 43, (Russian: Рапсодия на тему Паганини, Rapsodiya na temu Paganini) is a concertante work written by Sergei Rachmaninoff for solo piano and symphony orchestra, closely resembling a piano concerto. The work was written at Villa Senar in Switzerland in 1934. Rachmaninoff himself, a noted interpreter of his own works, played the solo piano part at the piece’s premiere at the Lyric Opera House in Baltimore, Maryland, on November 7, 1934 with the Philadelphia Orchestra, conducted by Leopold Stokowski. The 18th variation, by far the most popular, has been used in various movie and TV show soundtracks to different degrees. The Symphonic Dances, Op. 45, is an orchestral suite in three movements. This was the only major work Rachmaninoff composed fully in America; after preparing a version for two pianos, he completed the orchestral score in the fall of 1940, in time for the premiere to be given on January 4, 1941, by Eugene Ormandy and the Philadelphia Orchestra, to whom he dedicated the score. he Dances allowed him to indulge in a nostalgia for the Russia he had known, as well as to effectively sum up his lifelong fascination with ecclesiastical chants.